Faculty members in multiple departments in the School of Arts & Sciences met throughout the spring 2016 semester to discuss seminal works by renowned linguist and public intellectual Noam Chomsky. The discussions, addressing Chomsky’s works in linguistics and politics, took place in advance of Chomsky’s visit to the University from April 20 to April 22. On the afternoon of April 13, Jeffrey Runner, professor of linguistics and chair of the Department of Linguistics, and Theodore Brown, professor of history and the Charles E. and Dale L. Phelps Professor of Public Health and Policy, conducted a telephone interview with Chomsky reflecting some of questions that have been on their minds and the minds of colleagues. 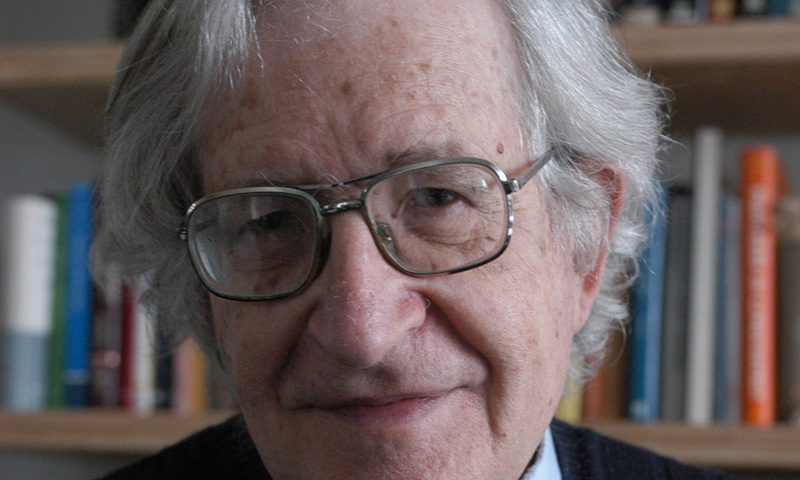 Chomsky will meet with both reading groups during his visit. The following is an edited version of those conversations. JEFFREY RUNNER: In your recent book, What Kinds of Creatures are We?, you discuss a variety of properties of language, such as its structure dependence, in your opening chapter, “What is Language?” At one point, you mention research in “computational cognitive science attempting to show that these properties of language can be learned by statistical analysis of big data.” You argue that these attempts have generally not been successful. What do you think the role is, if any, of other uses of so-called big data? For example, can big data play a role in the search for linguistic patterns in what we as linguists call corpus linguistics? Can corpus data be useful in testing syntactic hypotheses? NOAM CHOMSKY: It’s more complicated than that. Let’s go back to the early days of modern physics: Galileo, Newton, and so on. They did not organize data. If they had, they could never have reached the laws of nature. You couldn’t establish the law of falling bodies, what we all learn in high school, by simply accumulating data from videotapes of what’s happening outside the window. What they did was study highly idealized situations, such as balls rolling down frictionless planes. Much of what they did were actually thought experiments. Now let’s go to linguistics. Among the interesting questions that we ask are, for example, what’s the nature of ECP violations? You can look at 10 billion articles from the Wall Street Journal, and you won’t find any examples of ECP violations. It’s an interesting theory-determined question that tells you something about the nature of language, just as rolling a ball down an inclined plane is something that tells you about the laws of nature. Scientists use data, of course. But theory-driven experimental investigation has been the nature of the sciences for the last 500 years. In linguistics we all know that the kind of phenomena that we inquire about are often exotic. They are phenomena that almost never occur. In fact, those are the most interesting phenomena, because they lead you directly to fundamental principles. You could look at data forever, and you’d never figure out the laws, the rules, that are structure dependent. Let alone figure out why. And somehow that’s missed by the Silicon Valley approach of just studying masses of data and hoping something will come out. It doesn’t work in the sciences, and it doesn’t work here. JR: That gets to my next question, which has to do with the relatively new field of experimental syntax. The standard technique for collecting data to test syntactic hypotheses has been small-scale native speaker acceptability judgments. This method has yielded an immense amount of data that has facilitated the development of linguistic theory, as you describe in your book. Over the past 10 to 15 years or so, a growing number of researchers have adapted techniques from experimental psychology to run larger scale controlled experiments testing native speakers judgments on, and interpretations of, particular syntactic stimuli. Given that simply looking at random data drawn from speech or writing isn’t going to reveal the subtle complexities that we know underlie linguistics, what do you think about these methods that have been adopted in experimental syntax? NC: They’re quite valuable. So, for example, let’s look at the work of [associate professor of linguistics at the University of Connecticut] Jon Sprouse. He used [professor of linguistics at Queen Mary University of London] David Adger’s textbook, [Core Syntax: A Minimalist Approach], and carried out careful experiments of native speaker acceptability judgments, and found that there was an incredibly close correlation with Adger’s informal acceptability judgments, which are the judgments that linguists use. In Sprouse’s case, he was reacting to a paper by an experimental psychologist, [MIT professor of cognitive science] Ted Gibson, who was questioning whether native speaker intuitions are really capturing the facts. And what Sprouse discovered is they’re capturing them to a remarkably close extent. You can also use experimental syntax to investigate new questions. In fact, in their edited volume, Experimental Syntax and Island Effects, Sprouse and [professor of linguistics at the University of Maryland, College Park] Norbert Hornstein review interesting studies on questions such as, to what extent do island conditions reflect syntactic principles, and to what extent do they reflect performance factors? That’s an interesting question. So, yes, theory guided experiments designed to answer questions that arise in our effort to understand systems makes perfect sense. Sometimes the experiments are worth doing, sometimes not. The informal experiments we carry out all the time, every time we write a paper, happen to work remarkably well. But sometimes there are questions where we’d like to have better evidence. There you do formal, controlled experiments. On structure dependence, the neurolinguistic work done by people such as [professor of general linguistics at the Institute for Advanced Study IUSS, Pavia, Italy] Andrea Moro provides quite interesting experimental evidence about how deep the property of structure dependence is. There is confirming psycholinguistic evidence. What they basically show is that if you give people artificial languages, one group given one based on an existing language that they don’t know, satisfying [Universal Grammar] and using only structure dependent rules, and a second group given another that violates UG—say, that makes negation by picking the third word of the sentence and putting the negative particle after it—it turns out that you get different brain activity in each group. In the latter case, people are essentially solving puzzles and not investigating language. And there’s both psycholinguistic and neurolinguistic work supporting that, which is quite interesting. It shows that the property of structure dependence is not only overwhelmingly verified by descriptive linguistic work, but is also verified by neurolinguistic inquiry into what’s happening in the brain. That kind of experimental work can be quite valuable. JR: My last question relates to debates over island effects, which you mention in reference to Sprouse and Hornstein’s Experimental Syntax and Island Effects. I’m referring in particular to the debate coalescing around Sprouse and [the late professor of linguistics at Stanford University] Ivan Sag [BA, linguistics, 1971]. The Sag group was trying to show that some of the things that we thought of as island constraints can really just follow from understanding how processing works better. The Sprouse group has tried to show that it has very little to do with what we know about working memory. Where do you see this debate going? NC: I think it’s a mix. One of Ivan Sag’s papers picked up on the suggestion I made in The Minimalist Program about the superiority effect, and gave a fair amount of evidence that that speculation was probably accurate. In other cases, the Sag group—to the extent that they can show, say, that our subjacency judgments are constrained or effected by performance effects, that’s all to the good. That’s like work in the 1950s and early 1960s that I did and that George Miller and I did together, showing the differences between our ability to perceive and interpret embedding versus self-embedding. That’s a crucial difference. With embedding, we were able to show that people can go up to the levels of short term memory—up to about six or seven items or embeddings, as expected. But for self-embedding, it’s much narrower. You probably can’t go beyond two, maybe three, at the most. And that raises interesting questions about what’s happening. There are some proposals in my monograph Current Issues in Linguistic Theory, published back in the early 1960s, suggesting kind of a processing answer to this, which has been partially investigated, but it extends to what was later called the WH island effect. I think investigations like that, like I was doing in the 1950s and early 1960s, make perfect sense. Theodore Brown: I’d like to begin by asking you about the relationship between your linguistic and political writings. You established your international reputation in linguistics in the early and mid-1960s with books such as Aspects of a Theory of Syntax and Cartesian Linguistics. In 1967, you began a dramatic shift with your famous essay, “The Responsibility of Intellectuals,” in the New York Review of Books, followed by the publication in 1969 of your book American Power and the New Mandarins. In addition to your writings, you became involved directly in left-wing political activism. This looks like a remarkable change, at least in public presentation. What motivated you to make this transformation? NC: Well, actually, you used the phrase “public presentation,” which is crucial. I was engaged in radical political activism long before I ever heard of linguistics. That’s how I grew up and I never stopped. It became public in the early 1960s, when I became quite active, publicly, in opposition to the Vietnam War and then with my participation in the civil rights movement. The article that you mention in NYRB actually appeared earlier in a Harvard undergraduate publication. It was a talk that I’d given at Harvard to the Hillel Society, which they then published in their journal Mosaic. NYRB picked it up and I added footnotes and details, but it was essentially the same paper. But for me, this was just a continuation of my entire life. I did not put aside my linguistic work, which continues up to the present day. The difference was primarily that my politics became more public. Before 1967, my political activities were known in narrow circles that didn’t reach the public press. Actually, the first political article that I wrote was in fourth grade, about the rise of fascism. It was specifically about the fall of Barcelona in February 1939. I was very much concerned with not only the Spanish Civil War, but also the spread of fascism over Europe. But that appeared in the school newspaper. TB: Not the same circulation as the NYRB. NC: Yes, it was a little different. TB: You must be familiar with the article “What Are Intellectuals Good For?” by public intellectual George Scialabba. You’re one of Scialabba’s heroes, and he writes with great sympathy, but also with great concern, that when you first appeared on the public scene as a major public intellectual, you were extraordinarily well received, and yet, over the course of your career, you began to fall out of favor. In recent years, he claims, your articles and essays have not appeared in the New York Times, the New Republic, or NYRB, except very rarely and in small pieces. He hypothesizes that you’ve been cast aside as compared to other intellectuals, in part because of your forthright criticism of Israeli politics. Do you agree with that interpretation? NC: It’s a little misleading. Just taking the journals that you mentioned—TNR and NYT. I never had an article in TNR, in those days or since. NYT once published, as an op-ed, excerpts from testimony that I gave [in May 1972] during the Senate Foreign Relations Committee [hearings on “Causes, Origins, and Lessons of the Vietnam War”]. And once, in , they asked me for an op-ed, which I wrote, about the separation wall in the West Bank [“The Wall as a Weapon]. NYRB is interesting. From about 1967 to roughly 1972, NYRB did have an opening to left political commentary. So I wrote for them, and that ended by the early 1970s. I think it was a reflection of the mood of intellectual life through that period. The opposition to the Vietnam War was very late in coming. It didn’t really reach a significant level until about 1967 or 1968, and it’s worth remembering that by 1967, South Vietnam, which was the main target of the U.S. attack, had been virtually destroyed. Bernard Fall, the military historian and Vietnam specialist, perhaps the most respected within the establishment, wrote in 1967 that he doubted that Vietnam could survive as a cultural and political entity under the massive attack of the most powerful military machine that had ever existed—some words like that. But about that time that opposition to the war reached the point where it became visible. And it went on at a major level with popular mass movements into the early 1970s. And during those years, NYRB was open to the political left on many issues. Not, incidentally, on Israel-Palestine. They would never have allowed anything on that. George knows very well that I never had any appearance in journals like TNR, and rarely in NYT or NYRB. Elsewhere, interest in my political work is overwhelming. I must write 10 letters a day just turning down invitations for talks, because I can’t fit them into a very dense schedule. And there are big audiences, enthusiastic audiences, much larger than in the 1960s. For example, I began talking about the Vietnam War publicly at the time when President Kennedy escalated the war very significantly. It was almost impossible to find an audience. I would talk in somebody’s living room. Or in a church with four people. And as late as March 1966, in Boston, a pretty liberal city, we could not have a public demonstration against the war without it being attacked and broken up, often by students. Then by 1967, especially at the time of the march on the Pentagon, which is about when my first NYRB article came out, antiwar sentiment became a major force for several years. After that came a reaction. A very serious reaction. The popular movements did not end. They picked up again in the 1980s. But take a look, say, at TNR. Editorials were saying that we have to support, I think the wording was, Latin American-style fascists. Because there were more important things for our national interest than Salvadoran human rights. Not the exact words, but pretty close. So while the establishment intellectual community returned to its support for state power, along side it were growing popular movements which had their own modes of publication, organization, interaction, and so on. There were very strong movements against U.S. actions in Central America. But not much in the public sphere. Very little, in fact. It was mostly supportive. And that goes right up to the present. Take, for example, the invasion of Iraq, the worst crime of this century. The public debate ranges between two boundaries. There’s the hawkish side, which says if we’d fought harder, kept the troops there longer, we could have won the war. The dovish side is represented by people like President Obama, who is praised for the fact that he called the war a strategic blunder. It’s interesting that we praise somebody for calling a murderous act of aggression a blunder. But that’s not novel. For example, in the early 1980s, many Russian generals condemned the invasion of Afghanistan as a strategic blunder. We don’t honor them for that. It wasn’t a strategic blunder. It was a crime. But try to find somebody in the mainstream public sphere who refers to the invasion of Iraq as a crime. Which, in fact, it was. It’s what the Nuremberg Tribunal called the supreme international crime—a textbook example of aggression, differing from other war crimes in that it encompasses all the evil that follows. And that evil is pretty extensive. It includes, for example, the rise of ISIS. Who says that? Actually many people do, but nowhere near the mainstream. Certainly not in the journals you mentioned. TB: I’d like to close by asking you a very broad question. Looking back over your writings in the political domain, there seems to be a deep strain of pessimism, and of despair. There are also some moments of optimism, and of hopes for a better future. Where should we look for the sources for optimism? The sources for optimism, I think, are substantial. For one thing, just in the period we’ve been discussing, since the 1960s, there have been very substantial gains in many domains. In women’s rights, in civil rights to an extent, in opposition to aggression, concern over the environment—all kinds of things that barely existed in the 1960s are now almost common coin. And there’s been an increase in protection for freedom of speech, right up to the Supreme Court level. All of that is progress. It didn’t happen by magic. It happened by mass public organization and activism. And we can build on that legacy. And that’s reason for optimism. How extensive that optimism should be, well, that depends on what people like us and others, mostly younger people, choose to do with the opportunities they have.